Tribute Acts Management was founded 8 years ago in 2010 and is a vivacious and thriving management company, based in the UK with a genuine passion for quality productions. We have almost years experience in the entertainment industry and work hard with all our acts to ensure that you are getting the very best quality and talent every single time you book us! In 2016 we were very proud to have been nominated for two awards at the ‘National Tribute Music Awards’. 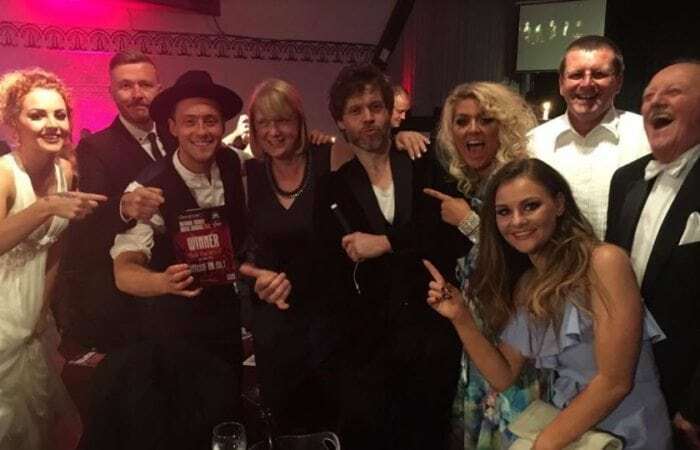 We were shortlisted for ‘Best Website’ and also won the award for ‘Number 1 Take That tribute band’ with our hugely popular act ‘Rule The World’. Many of our shows such as ‘Rule The World’ are exclusively owned and produced by ourselves and come fully self-contained with sound engineers, drivers, sound equipment, lighting equipment and costumes to make your event look and sound amazing! Attention to detail is everything with all our acts! We know how important your event is to you, and it’s just as important to us that we help make it the standard you deserve, and hopefully we will be back there again next time you need entertainment! Don’t settle for second best – book one of our shows now! Matt has almost 20 years experience in the entertainment business. Having performed himself on stage around the world for many years and worked in Television for BBC1, ITV1 and Channel 4, he knows what it takes to produce quality entertainment productions. He founded Tribute Acts Management in 2010 and has been a key driving force at the front of the company throughout the last 8 years since its formation. Anita joined us full time in early 2016 and has been a huge asset to our team and a large driving force behind the speedy growth of the business. Her friendly manner, attention to detail and professional approach has seen us receive an enormous amount of amazing feedback from many so many clients who have told us how thankful they are to Anita who played such an important role in getting their entertainment right and assisting them through the process. No job is too big for Anita and she is always happy to help. She now manages our office team. Emily, entertainment coordinator and fellow tribute act herself has been performing for over 10 years in the tribute industry. She still currently performs in our Little Mix and Spice Girls tribute shows and is out there ‘on the front line’ every single week performing up and down the country and occasionally abroad. She certainly knows everything there is to know about how an event needs to run and we are confident in saying you are in very safe hands. Terrie is the newest member to our team joining us at the very beginning of 2018. She has worked within the customer service industry for over 20 years so she understands the importance of customer satisfaction to any business. With a friendly and professional approach we can’t wait for you all to get to know her more. Grace has worked in marketing, design and as an actor for many years and we were delighted when she joined our team. Her bubbly and friendly persona is a delight to have in the office and keeps everybody smiling throughout the day. Grace is a very hard working professional who genuinely cares about the clients and the acts needs equally and she will always go that extra mile to provide the best possible service and will do it with a smile. Holly has been a performer herself for over 10 years and knows what it takes to produce high quality and successful shows. Having performed in our tribute acts for many years, Holly now works assisting clients and acts in event organisation and particularly enjoyed working on weddings helping brides and grooms create their perfect day. John has over 10 years experience as both a booking agent and tour manager and joined Tribute Acts Management in 2010. Known as the real Mr nice guy in show-buisness to many, John has been a huge asset to our company with his caring and professional manner. Jack is a highly skilled and professional guitarist and has over 20 years experience gigging in out on the road in bands. Since graduating from his music course at university he has simply not stopped touring. He continues to be on the road for our company every week working with a large variety of our tribute shows. Attention to detail is everything for Jack and he is always insitant in doing the best job possible cutting no corners whatever the situation. If a jobs worth doing, Jack will tell you it’s worth doing right or not at all! Jamie is a highly experienced and passionate digital marketing professional with specialities in the technical and strategic side of Digital Marketing. He also efficiently executes the building and leading of highly effective teams across a range of disciplines. Jamie joined our company in 2013 and has been a key factor in the company’s growth.